Deep pink in colour and retaining that unique beet flavour, this curry makes a stunning addition to curries. 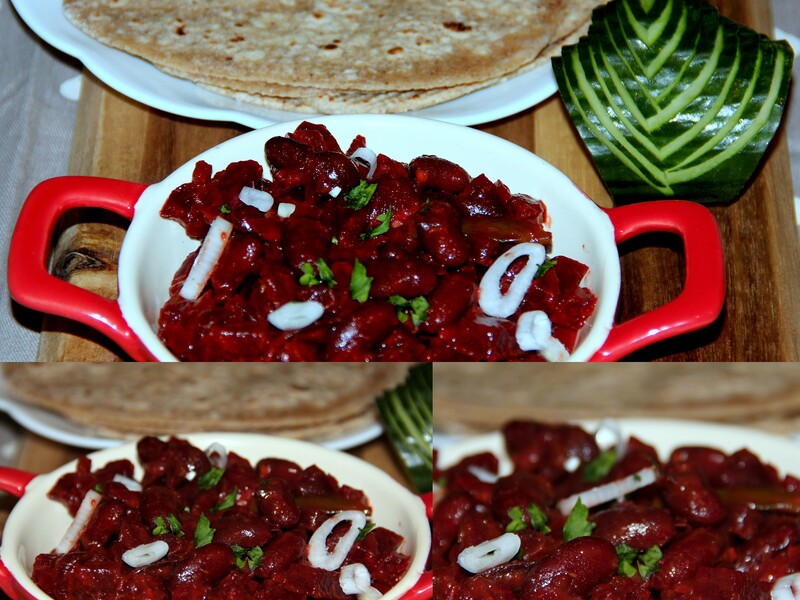 Addition of kidney beans, onion and tomatoes tastes like an authentic Rajma Curry. The spices and mint adds flavour to the curry along with ginger and garlic. Beets are small herbaceous plants with broad dark-green leaves. Although the leaves have always been eaten, historically the beet root was generally used medicinally for a range of ailments, including fevers, constipation and skin problems. More recent health claims suggest beetroot can help lower blood pressure, boost exercise performance and prevent dementia. Heat 1-2cm water in a large sauce pan and place the chopped beet on a colander/steamer and steam until soft and tender. (approx. 12-15minutes) and keep aside. Drain and rinse thoroughly timed kidney beans to remove sodium content. Heat oil in a skillet/pan add cumin seeds as it splutters add the grated ginger-garlic, slit chillies and saute for a minute or two, stirring continuously. Add the onions and continue to cook until the onions are soft. Then add steamed beetroot and rinsed rajma/kidney beans and cook further and bring to boil, stirring regularly. Finally add in chopped mint, salt and cook for a few minutes until the greens are tender. Turn off the flame and stir in lemon juice. Can skip chilli powder and just use chillies to reduce the hot. Posted on November 10, 2014, in Indian, Side dish. Bookmark the permalink. 6 Comments. Wow. This recipe combines lots of ingredients that I absolutely love; I’m always eating red beans, beets and love spices like these — but never have I thought to combine it all and make something like this. Will have to make this asap! Thanks for yet another delicious, interesting, and healthy recipe! My pleasure…It is such a nice feeling to great these motivations…. I love beets, so I am sure I would love this dish. Sounds wonderful! I am gonna try this one, too. Like beets, like beans, like curry.